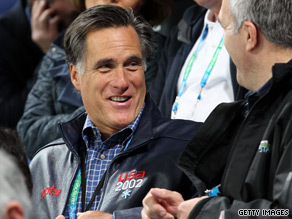 Romney took in the opening weekend at the Winter Olympics in Vancouver. (CNN) - Even former presidential candidates are subject to the occasional annoyances of air travel. A passenger seated in front of former Massachusetts Gov. Mitt Romney's wife became "physically violent" when the former Republican presidential candidate asked the passenger to move his seat in a more upright position. The incident occurred Monday when the Romneys were headed from Vancouver, Canada to Los Angeles on an Air Canada flight, according to spokesman Eric Fehrnstrom. In a statement to CNN, Fehrnstrom said "Romney did not retaliate, but instead allowed the airline crew to respond to the incident." Following the uproar, the plane returned to the gate where the passenger was removed by airport police. Romney was not injured. Poor Mittens. See..Nobody likes you, even fellow passengers. You've already did the state of MA a disservice by foisting yourself upon them as governor. Now, you & Jeb & Newt stick your presdential aspirations where the sun don't shine and, like Brett Favre, just GO AWAY...PLEASE! I would not wish harm to Mr. Romney or his family in any way but feel like something is being omitted here. How do you go from "Would you mind moving your seat up a bit?" to physical violence? Think there's more to this story. Let's be honest- what kind of arrogant jerk asks someone else not to recline their seat on a flight? The seats recline, what, an inch and a half? And Romney's wife couldn't handle that for a 2-hour flight? Did she recline her seat? I would be willing to bet that she did. And I'm sure she didn't ask the passenger behind her if she/he was comfortable. If having the person in front of you recline is too uncomfortable for you, perhaps you should consider springing for First Class. I wish that Mitt Romney had won the 2008 election. He was the perfect fit for the challenges that our country faced/faces. Unlike Obama, he would have focused on the immediate problem (economy) and trimmed government spending and helped restore free market principles and been able to enact policies that would have increased job growth. Most people that didn't/don't want him base it on his: "perfect hair, looks". he's been successful in business–I don't like bosses, he's rich and spends his own money on his campaign, his religion (although he hasn't pushed in on anyone), and the so-called flip-flop on abortion (people can change their mind)–it's not like Kerry, who changed sides each week. Oh, and again, Romney's perfect hair.